The big picture: Figuring out the logistics of away-from-home battery charging is arguably just as important as mastering the vehicle itself. Volkswagen's mobile battery stations make a lot of sense on paper, but will that success translate to the real world? Electric vehicles are poised to overtake their combustion engine counterparts in the not-too-distant future. As companies like Tesla have already demonstrated, a key cog in the successful transition to electric vehicles is the installation of a network of chargers that allow drivers to top off their batteries when out and about. Tesla has elected to tackle the issue through permanent Supercharger installations but Volkswagen is taking a slightly different approach. The German automaker recently offered a first glimpse of its mobile charging stations. Akin to power banks for smartphones, these mobile stations afford several benefits over permanent solutions. For example, cities could use them to gauge the most suitable locations for chargers before investing in a more permanent solution. They could also come in handy at events like concerts, football games or other gatherings that attract a lot of people. An app (or the Internet) can be used to locate nearby stations, we’re told. Each charging station offers a total battery storage capacity of 360 kWh and can charge up to 15 EVs. Up to four vehicles can be charged at once: two via DC and two via AC. Thanks to quick charging technology, Volkswagen says the charging process takes just 17 minutes on average. 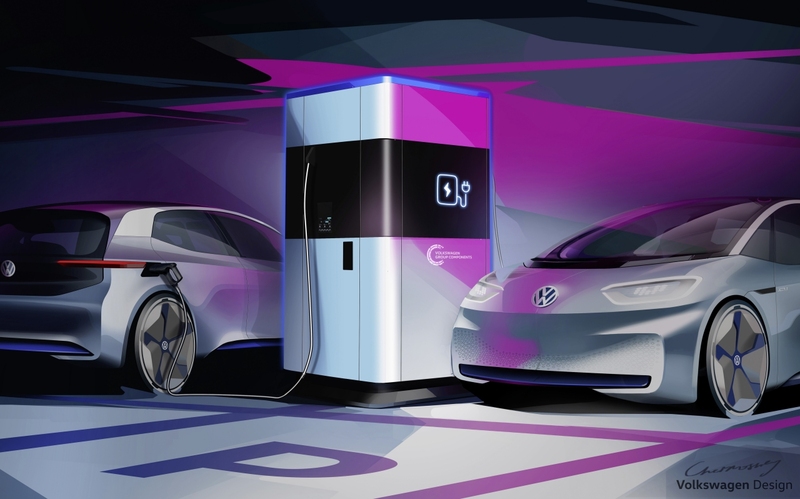 Volkswagen intends to pilot its quick charging stations in its hometown as early as the first half of 2019 before expanding to other cities the following year.